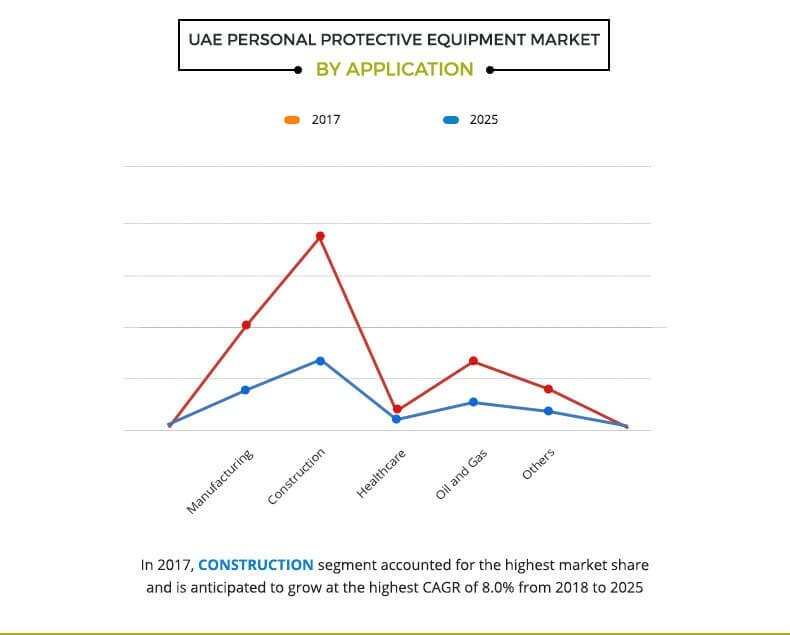 The UAE personal protective equipment market was valued at $401.4 million in 2017, and is projected to reach $702.4 million by 2025, registering a CAGR of 7.3% from 2018 to 2025. Personal protective equipment are adopted when engineering controls and administrative controls are not practicable or effective to lessen the risks to acceptable levels. Stringent government regulations regarding safety standards at workplace and increased awareness among workers for safety precautions leads to the higher utilization of PPE. The major players profiled in this report include Honeywell International Inc., 3M Company, E. I. Dupont de Nemours and Company, Ansell Limited, Kimberly-Clark Corporation, JSP Limited, Venus Safety & Health Pvt., Ltd., Dream Castle Technical Supply LLC, Schefferville Trading LLC, and Vaultex. The report also includes various other manufacturers/distributors of PPE such as MSA Safety, Al Asayel Health & Safety, Uruguay Oil Field & Safety Equipment, Spark international Energy L.L.C., Specialised Technical Services (STS), and Atlas Safety. Hands & arm protection equipment, which had the maximum share in 2017, drives the market growing at the highest CAGR of 8.3%. Hands & arm protection equipment form the basic requirement for personal safety and finds application in almost every industry. Rapid growth in construction and manufacturing industry majorly drives the sales of hands & arm protection equipment as the workers have to deal with chemicals, hot objects, and high impacts of machineries & tools. Protective clothing is another lucrative market, anticipated to grow at a significant CAGR of 8.0%. Awareness amongst the worker about the safety and precaution supplements the growth of the protective clothing market. A large number of new construction projects are started in recent years in the UAE, which includes residential projects, infrastructure, and entertainment venues. Major roadways, railways, airport, and port upgrade projects, which includes Dubai & Abu Dhabi metro, Emirates road, Etihad railway network, Dubai & Abu Dhabi airport are ongoing in preparation of further expected population influx. In 2017, construction application segment accounted for the highest market share and is anticipated to grow at the highest CAGR of 8.0%. 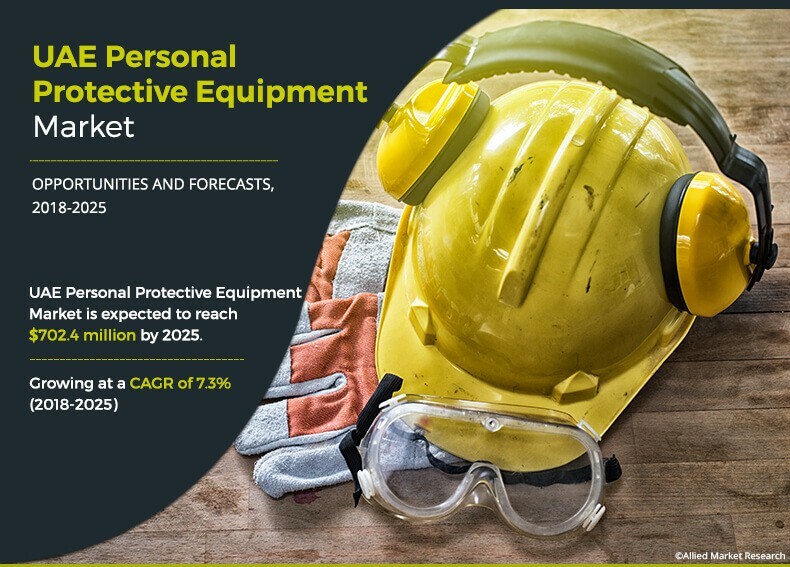 This report provides a quantitative analysis of the current trends, estimations, and dynamics of the UAE personal protective equipment market from 2014 to 2025 to identify the prevailing market opportunities. Market share analysis provides a clear understanding of the present position of market players. The report includes in detail analysis of the UAE PPE market, key players, market segments by type and application, and growth strategies. 6.4. E I dupont de Nemours and Co.
6.11. Dream Castle Technical Supply L.L.C. 6.14. Spark International Energy LLC. Personal protective equipment, or PPE, are clothing or equipment, designed to provide protection from the risk of accidents, and injury on or off the workplace. Even where engineering controls and safety systems have been applied, some hazards might remain. Personal protective equipment provides protection against, physical, electrical, heat, chemicals, biohazards, airborne particulate matter, and countless other possibly hazardous situations. Stringent regulations laid by the government and implementation of advanced legislations at workplace to protect workers from hazardous situations coupled with increased awareness among workers regarding safety precautions have led to the higher utilization of PPE. Industries such as construction, manufacturing, oil & gas, healthcare, and others continue to show positive annual dynamics. Several new building and construction work and infrastructure upgrade projects have been started in recent years in the UAE, which is anticipated to boost the application of PPE in the construction sector. Robust infrastructure, strategic location, and significant subsidies for manufacturers have led the UAE government to invest heavily in the manufacturing sector thereby making it one of the highest contributors to the country’s economy. Along with the manufacturing of petrochemical products, UAE has become an important producer of metals, such as aluminum & steel and building materials, which includes cement, ceramics, and glass. It has emerged as a manufacturer of pharmaceuticals, food & beverages, and a wide variety of consumer goods. Moreover, it has a growing aerospace & defense manufacturing sector. Thus, growth in manufacturing sector of UAE is anticipated to create new opportunities for the PPE manufacturers; thereby, driving the market growth. However, job displacement from labor-intensive industries in UAE has been taking place for several decades, as the countries adopt automation across various industries as a step toward higher value-added activities and services. Thus, job cut due to automation in labor-intensive industries in UAE is projected to hamper the growth of the PPE market. 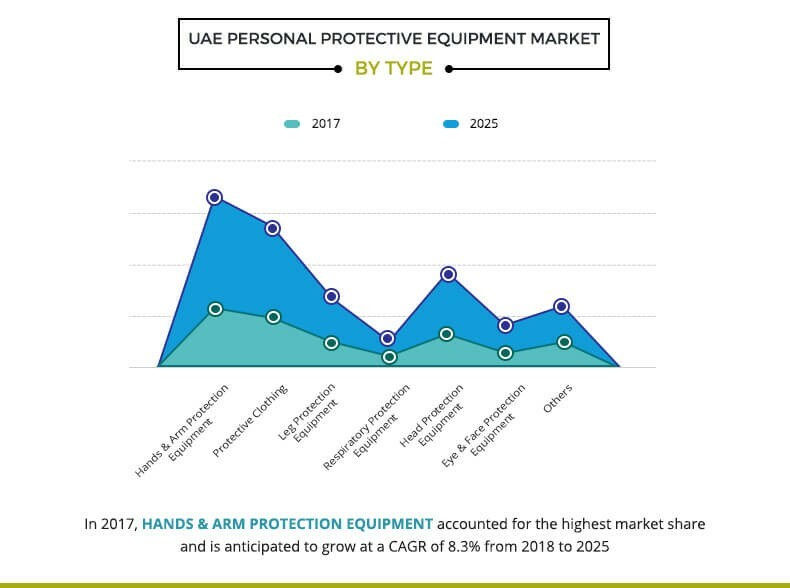 "UAE Personal Protective Equipment Market"